Fun4theBrain Chatter! : How to Draw: Zaga! 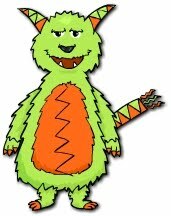 This week's monster drawing lesson is ZAGA! Zaga has zig zags all over him. Instead of walking, Zaga zig zags all over the place. Zaga likes to play with toys that only zigzag around. Zaga only eats zigzaggy french fries and zigzaggy chips. Zaga is a friendly monster. Thanks to Megan M. from Accra, Ghana for this awesome and helpful monster for Murb! Step 1: Lightly draw Zaga's body by making a circle and two rounded triangles. 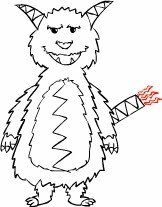 Step 2: Add fur to the lines by making zig zag lines over the lines for his body. Step 3: Draw shaggy lines for the different parts of his face. Step 4: Add in his facial features by drawing circles in his eyes, a U shape for his nose and a curve and triangles for his mouth and teeth. Step 5: Draw his shaggy arms. Step 6: Add in his claws with three triangles. Step 7: Create shaggy lines for his legs. Step 8: Add in Zaga's feet by using two lines and three triangles without the bottom line. Step 9: Draw Zaga's horns with two curved lines. Step 10: Draw a box on the side of him that will become his tail. Step 11: Add Zaga's zigzags to his horns, belly and tail. Step 12: Add Zaga's zigzaggy tail hairs. Have fun with Zaga. He will be appearing in a new game in Murb very soon! !